The Award Winning ... child-genius-prodigy (Honorable Mention at Mrs. Slowinsky's third grade "Finger-painting Challenge"), artist-writer-type-of-guy Tony DiTerlizzi, was born in California in 1969 (Yes, that was the "Summer of Love", and yes, Tony was a product of that loving that occurred during that summer). Growing up in a creative household, Tony's heroes include the likes of Norman Rockwell, Arthur Rackham, Dr. Suess, that Roald Dahl guy, and Fozzie Bear. He attended a couple of art schools and a local community college (because he was really bad at Math and had to drop out until he got it right) which were Florida School of the Arts and The Art Institute of Fort Lauderdale. His early work in 1992 for TSR's Dungeon & Dragons game earned him attention in the field of role-playing fantasy games (RPGs). He helped create several worlds for the RPG market such as Planescape and Changeling. Tony continued to work in the gaming field for most of the 90's including working for Wizards of the Coast and their mega-hit-gazillion-dollar collectible card game, Magic the Gathering. By early 2000, he became author and illustrator of such spectacular literary masterpieces as Ted and Jimmy Zangwow's Out-of-this-World Moon Pie Adventure, both published by Simon & Schuster Books. He has also doodled in other books such as Alien & Possum, Ribbiting Tales and Dinosaur Summer. He rules the kingdom of Brooklyn, in the land of New York, with his wife Angela as queen, and their pug-dog, Goblin as...well...a...goblin. 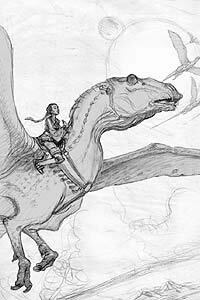 Growing up a fan of Anne McCaffrey’s classic Dragonriders of Pern series, I was so excited when Delrey Books asked me to do my rendition of the famous thread-burning dragons. I felt honored to join the other fine illustrators, like the Hildebrandt brothers and Michael Whelan, who have tackled this world before me. The important thing Anne conveyed to me for this project was that the books were more the stuff of science fiction and less traditional fantasy. 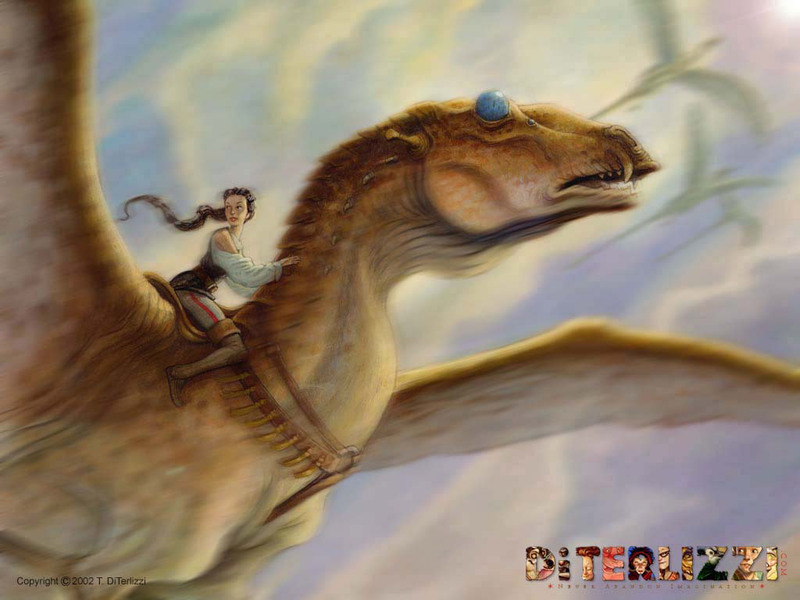 I really tried to bring an otherworldly look to Pern, and I felt the dragons were the key to this. Once I was satisfied with their design, I moved onto the characters, then the architecture, and finally the world itself. One last note: the version of Ruatha Hold posted here differs from the final printed version found in the book. I thought you might like to see this gothic cathedral-inspired version.